Hi everyone! It's Christine here with a super fun card to share with you today here on the Craftin' Desert Divas Blog! For my card today, I inked up this adorable surfin' alligator from the adorable brand new Sunny Smiles Stamp Set. I water colored him with my Zigs and a water brush. 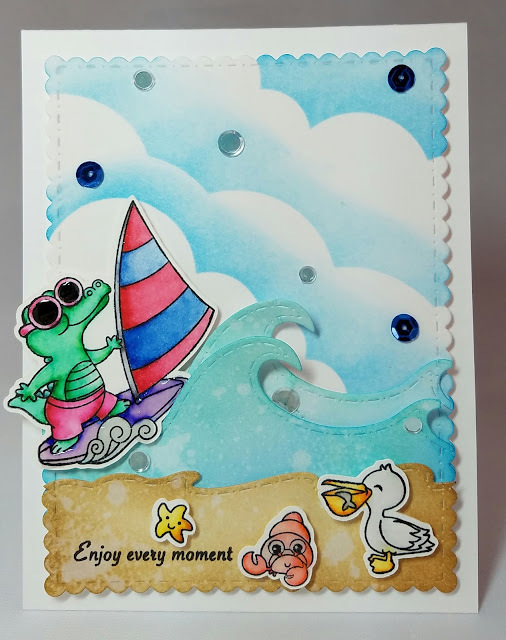 I then created my background using the brand new Ocean Border Dies. I used Broken China Distress Oxide Ink to ink up my sky and Cracked Pistashio Distress Oxide Ink and Broken China Distress Oxide Ink for the waves. I hope you like today's card! Thanks so much as always for stopping by. Huge hugs! Cute!! Love the surfin' alligator!! Fun card, indeed! Love it!